Project Mission: Making the switch from paper or plastic to fabric! Teresa is a mom of 3 and a professor of photography, and she is also the wonderful woman behind the Green Bag Lady Project! 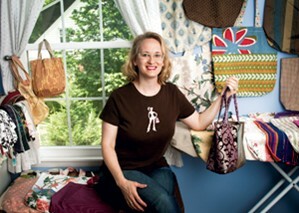 Her goal is to help others switch from using paper or plastic, to using cloth bags that are reusable. She feels very strongly about spreading this message, and was kind enough to give us an interview about her and her project. I am a photography and digital imaging professor at Belmont University in Nashville, TN. I have been teaching there for 13 years. I have been married for 15 years to a wonderful hubby and we have 3 kids, 2 girls and a boy, 11, 8, and 6. Hobbies? Well, sewing (of course), embroidery, photography, really anything creative. When I get motivated, I like to do pilates and walk with my iPod. 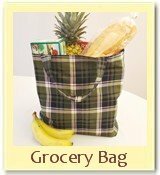 What got you interested in making recyclable shopping bags and how did the Green Bag Lady Project get started? I am adamant that I am NOT selling the bags or getting any compensation for them. They are a gift. I want the receiver to feel obligated to use them, that is why I require the promise to use them instead of paper or plastic. Do you run this project all by yourself, or do you have any help? I made the first 600-700 bags myself and then wonderful ladies and my retired father offered to help. They are called "Bagettes." 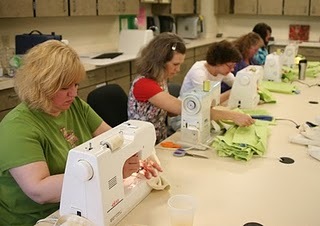 I now have about 12 ladies that help cut, iron and sew. My father (Bagette Dad) helps with emails, shipping and maintaing the website. These are also the same amazing people that help give out bags at events. How long does it usually take to make one of these bags, and about how many have you made? It takes about 10 minutes to make a bag, though no one makes them from start to finish. By the time they are done, they have been through 3-4 sets of hands. We meet on Sunday afternoons and cut out the fabric, iron on labels, and mark where the handles should go. They are then sent home with people to be sewn into finished bags. We have given away almost 13,000 bags! How long have you been making these bags now, and where all have they ended up? I have been making these bags since January of 2008. Green Bag Lady bags have ended up all over the world. They are in all 50 states plus over 170 other countries. Where do you get the majority of your fabric? All of the fabric is donated by companies or individuals. We now have some companies that are sponsors and send us fabric on a regular basis like Harmony Art, Amy Butler, Swavelle/Mill Creek and Les Indiennes. We get overstock, seconds, samples, etc. I have never bought fabric to make bags. Who received some of your first bags, and how can someone get one now? Do you have any tips or advice to help people use cloth bags more often? If you forget your bags in the car and are already at the check out, just have them put your items back in the cart and bag them in your fabric bags once you get to your car. Not just for groceries. Use them for all your shopping, even the mall! Leave your bags in the car so they are always with you. After you unload the bags in your home, hang them on the door knob so you grab them on your way out the the car! Find alternatives to wrapping paper. How about wrapping a present in newspaper, magazine pages OR a fabric bag! Do you make or sew any other items, and if so, what are they? Yes, I make hand embroidered baby items that people buy as gifts and most of my kids' pajamas. I also make curtains, pillows and occasionally blankets or quilts. 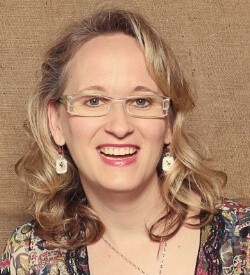 What is the most rewarding part of the Green Bag Lady project? What has been the most difficult aspect of this project? Hmmm, I suppose doing research for the blog and finding out more and more about what a huge problem plastic is to our environment. Literally tons of it is in our oceans, they are choking with plastic. It's so sad. What is your future hope or dream for the Green Bag Lady Project? My dream is that everyone, all over the world will use reusable bags and reduce the amount of plastic they consume. We'd like to thank Teresa for taking the time to do this interview with us, and give us further insight into the Green Bag Lady Project. It truly is a great cause and we hope that all of our readers will make the switch to reusable fabric bags!